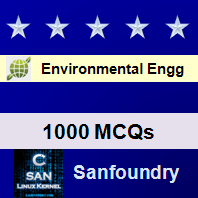 This set of Environmental Engineering Multiple Choice Questions & Answers (MCQs) focuses on “Various Unit Operations”. 1. In which unit operation, gases are released or absorbed in water? Explanation: In Gas transfer, gases are released or absorbed in water by exposing the water through aeration under normal, increased or reduced pressure. 2. How many types of aerators are commonly used in the treatment of water? Explanation: There are 4 types of aerators namely Gravity aerators, Spray aerators, Diffusers and Mechanical aerators. 3. Which of the following process is used to remove the colloidal particles from water? Explanation: Chemical coagulation is used to remove colloidal particles by the use of coagulants which increase the particle size and they settle down. 3. Flocculation of iron from water by addition of lime is an example of which of the following process? Explanation: Chemical precipitation removes the dissolved substance from water through ion transfer where precipitation of dissolved impurities takes place. 4. In which unit operation objectionable solutes are converted into unobjectionable forms without removal? Explanation: In solute stabilization, water is stabilized by chlorination or liming so that objectionable solutes are converted into unobjectionable form. 5. In which form of solute stabilization, hydrogen sulfide in water is oxidized into sulfate? Explanation: By the process of chlorination, water gets stabilized by the conversion of hydrogen sulfide into sulfate. 6. Which form of solute stabilization occurs when water passes through limestone? Explanation: When water passes through limestone, carbon dioxide in excess get converted into soluble bicarbonate. 7. In which process, excess lime is converted into bicarbonate? Explanation: By Re-carbonation of water softened by excess lime treatment, excess lime is converted into bicarbonate. 8. By which process, odour producing substances is oxidized? Explanation: By addition of chlorine dioxide to water, odour producing substances are oxidized. 9. Solids are removed from the water by which of the following unit operation? Explanation: During solids transfer, solids are removed from water by straining, sedimentation, flotation and filtration. 10. State whether the following statement is True or False. Dealkalization results in removal of all the ions from the water. Explanation: Dealkalization results in removal of hydroxides, carbonates and bicarbonates of calcium, sodium and magnesium from water. Demineralization results in removal of all the ions from the water. Explanation: Organic contaminants are removed from the water by the attraction and accumulation of one substance on the surface of another.